According to a recent study, dog owners are getting more exercise than gym bunnies. The research was carried out by a pet care expert, Bob Martin, and they found that dog owners were getting regular exercise from walking their dogs, exercise that they wouldn’t otherwise be getting. The research claimed that the average dog owner took their dog for a walk twice each day, for an average of 24 minutes each walk. This comes to a total of 5 hours, 35 minutes exercise per week. The researchers also claimed that dog owners took their dogs for extended walks three times per week, which meant a further 2 hours 33 minutes exercise for the owners and the dogs. When compared to non dog owners who hold gym memberships, the researchers found that the average person exercised at the gym for 1 hour 20 minutes each week, or spent the same time jogging or walking – without a dog! 47% of non dog owners admitted to doing no exercise at all. A couple of short walks a day soon adds up and this research shows that it amounts to more time than people spend in the gym. And whilst gym-goers exercise inside an air-conditioned gym, dog walkers are able to rack up the miles and enjoy fresh air whilst admiring the Great British countryside. The research was carried out via a survey that quizzed 5,000 people. 3,000 of those were dog owners. 22% of dog owners said they saw walking their dog as a chore, whereas 86% said they thoroughly enjoyed taking their dog for a walk. Just 16% of the people questioned admitted to actually enjoying exercising in the gym. By contrast, owning a dog makes your life much healthier as 60% of those questioned said they take their dog for a walk regardless of time and weather. 46% of gym membership holders by contrast said that bad weather and time constraints often interfere with their gym attendance. With increasing focus on leading an active healthy lifestyle it seems that owning a dog makes us more healthy. The Government recommends 30 minutes of moderate cardio vascular exercise 3-5 times per week and it’s encouraging to see that dog walkers are exceeding this target and enjoying it at the same time. One celebrity who finds walking her dog a healthy option is Jessica Biel. Jessica is currently filming the big screen version of The A-Team, and her regular dog walking with dog Tina has kept her in shape for the physical demands of a big screen action movie. 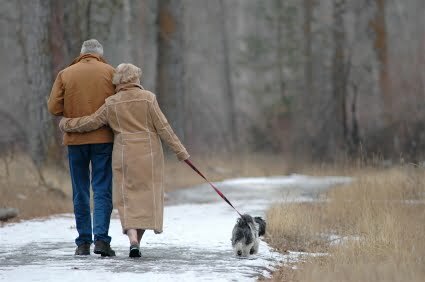 How often do you walk your dog, and do you consider it a chore or a pleasure?